Ginger is beneficial in winter as well as many medicines. check out this some of the important ginger juice mixture of ginger, which you can use in winter. Ginger-Lime Juice: Drink mixture of 4 teaspoon ginger juice, 4 teaspoons honey, 2 teaspoon lemon juice and 1 cup lukewarm water. 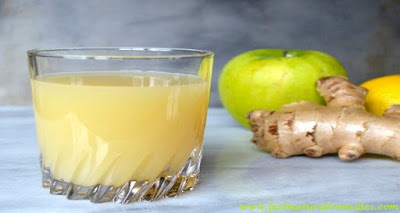 Ginger Juice-Honey: Drink mixture of 2 teaspoon ginger juice and 2 teaspoon honey in morning. It cleans the blood. Ginger Juice-Camphor: Prepare paste of ginger juice and camphor. Apply it on pain. It is very beneficial to remove pain. Ginger-Mint Juice: Drink mixture of one teaspoon ginger and mint juice along with one pinch of rock salt. It is extremely beneficial in stomach pain. Ginger Juice-Cow Milk: Drink mixture of one teaspoon ginger juice and one glass cow milk. It is beneficial in hiccup. Ginger Juice-Sugar: Drink 2 ginger juice with sugar in morning. It is beneficial in urine problem. Ginger Juice-Jaggery: Drink mixture of 2-3 teaspoon ginger juice and jaggery in morning. It is beneficial in inflammation. Ginger Juice-Sesame Oil: Prepare mixture of one cup ginger juice and half teaspoon sesame oil. Apply this mixture on joint pain. Ginger Juice-Lukewarm Water: Drink mixture of one teaspoon ginger juice and half cup lukewarm water in morning. It is extremely beneficial in respiratory disease. Ginger-Basil Juice: Drink mixture of one cup lukewarm water, one teaspoon ginger juice, 10-15 basil leaves, one teaspoon lemon juice and one teaspoon honey.